Carrot halwa was the first Indian dessert I got to try. Since then I tried many more, but it remained my favorite (not sure whether it is a coincidence). It is something comforting, warm and sweet. Something rich and mild. Something I'd never expect from the carrot. Like in English carrot cake it works in some magical way here. 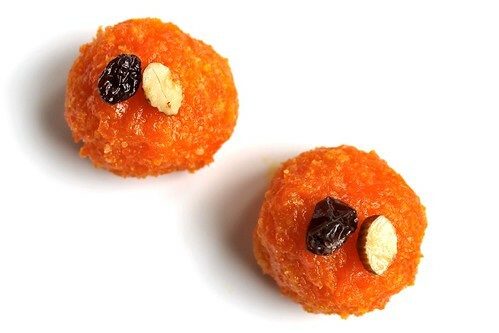 The classic version of carrot halwa is quite sweet (as most other Indian desserts). It assumes that you eat just a little piece or two after your meal. However sometimes it is eaten as a breakfast (or afternoon snack) and then it makes sense to make it less sweet and eat some larger portion. To me it is one of the best breakfasts I can have. Making it is nothing difficult. It takes some time though (around half an hour), when you will need to stay close to the stove and stir from time to time. It is very enjoyable as the halwa gets pretty and fragrant throughout the process. Quite meditative, like making risotto, but easier. In essence, you cook some coarsely grated carrots in milk till they get completely soft. Then you add sugar, almond flour and cardamon. Cook a little more and you are done. The halwa gets incredibly coral, thick and delicious. You let it cool (if you can) and enjoy. Though I normally start enjoying already while I'm scraping out each and every little bit of halwa that stick to the bottom of the emptied pan. Normally you layer it around 2 cm thick and let it cool. Then you slice it into squares or other shapes, decorate with nuts and raisins and serve. I do prefer shaping it into little balls, though it looks weird to my Indian friends. For the breakfast version, you can just fill a little bowl with it and no shaping is needed. It makes sense to pick a large heavy base saucepan (as the larger the pan the shorter the cooking time). Set the pan over medium heat. Add the ghee and let it melt. Add the cashews (or almonds) and raisins (or sultanas) and cook stirring for 1-2 minutes till they brown a little. Transfer the nuts and raisins to a plate and set aside (these are for decoration later). To the pan add the carrots and milk. Bring to a boil, reduce the heat to medium-low and cook without lid, stirring occasionally for 30 - 35 minutes. The carrots should get very soft and soak up all the milk. Add the sugar and mix it in. You will see the mixture becoming liquid again, which is OK (the sugar forces water out of the carrots). Keep cooking and stirring for 5 - 10 more minutes till the halwa gets quite thick. Add the cardamon and almond flour. Mix well and keep cooking and stirring on low heat for 5 more minutes. Take off the heat, transfer to a baking tray or plastic container (so that the layer of halwa is around 2 cm thick). Let cool to room temperature. If you made it in advance, store it in the fridge before shaping. If you are serving the halwa as a dessert the classic way is to cut the layer into little squares, rectangles or diamonds. Another way (which I prefer though it is not sacral) is to make little balls (around 2 cm in diameter) with your hands. If you are serving the halwa for breakfast, just fill several small bowls with it. Decorate each piece or bowl with nuts and raisins.